Anjum Fakih, the famous Kundali Bhagya face had her fan moment as she met the household name, Divyanka Tripathi. Fakih who essays the role of Shrishti in the show recently took to her official Twitter account to share an adorable photo of her hugging Yeh Hai Mohabbatein actor. There are reports that Divyanka Tripathi's famous show starring Karan Patel will go off air in October. Anjum Fakih, the famous Kundali Bhagya face had her fan moment as she met the household name, Divyanka Tripathi. Fakih who essays the role of Shrishti in the show recently took to her official Twitter account to share an adorable photo of her hugging Yeh Hai Mohabbatein actor. Calling Tripathi her inspiration, the beauty in her post wrote, “When you are her Fan and you get to kiss her too my inspiration Divyanka fan. I wish all the happiness for you. Love you Soo much.” Take a look at the photos shared by the Fakih. 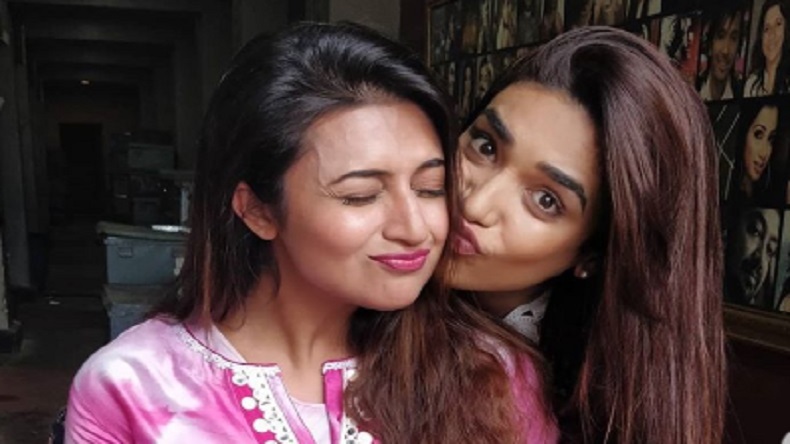 In the adorable picture, Anjum is seen kissing Divyanka on her cheeks while both are seen happily posing for a picture. Talking about the work, Anjum Fakih’s show Kundali Bhagya stars Shraddha Arya, Dheeraj Dhooper, Manit Joura, Abhishek Kapur and Sanjay Gagnani. The romantic television drama is a spin off of Kumkum Bhagya. On the other hand, Divyanka Tripathi’s famous show Yeh Hai Mohabbatein has been running for over five years. ALSO READ: Karan Johar the next god father of Khushi Kapoor, Aryan Khan? Well, there is a bad news for Divyanka Tripathi fans as there are reports that Yeh Hai Mohabbatein will go off aur in October, this year. The show that stars beautiful diva Divyanka Tripathi and Karan Patel, will have its last episode show in abroad. Produced by Balaji Telefilm’s owner Ekta Kapoor, the story revolves around a Tamil dentist and Punjabi businessman, who decide to get married in order to take good care of Ruhi. As per sources, the beauty known for her mesmerizing voice and expression queen Divankya Tripathi will next be seen in Ekta Kapoor’s web series as a chef.